Dr. Samer Cheaib is a Maternal Fetal Medicine Specialist. 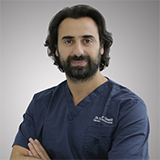 Before joining Fakih IVF in August 2014, Dr. Samer worked at Healthcare City as a Fetal Medicine Specialist. Prior to that, he worked at Fakih IVF in both Dubai and Lebanon from 2011 to 2014. From 2010 to 2011, he worked as an assistant professor of Obstetrics and Gynecology at the George Washington University School of Medicine and Sciences. Dr. Samer Cheaib specializes in high-risk pregnancies as well as twin and triplet pregnancies. He is also an expert when it comes to complicated pregnancies, cervical incompetence, rescue cerclages and many aspects related to preterm labor and recurrent pregnancy losses. He closely follows up with his patients and does his best in achieving a healthy outcome for the mother and baby. In addition, he performs first and second trimester prenatal screening, detailed ultrasound scans, amniocentesis, CVS, natural and Caesarean section deliveries and others prenatal care services. His interests also include all aspects of Gynecology, Gynecologic Laparoscopy, urinary incontinence and Reproductive Endocrinology, including Polycystic Ovary Syndrome (PCOS) and Recurrent Pregnancy Loss. Medcare Hospital- Jumeirah Canadian Hospital City Hospital Membership: The American Congress of Obstetricians & Gynecologists and the American Medical Association. Education: Dr. Samer earned his Medical Degree from the University of Baghdad in 2002 before graduating from the American University of Beirut in 2008 specializing in Obstetrics and Gynecology. He then completed a three-year fellowship in Maternal Fetal Medicine at Inova Fairfax Hospital in Virginia, USA, which is considered one of the most reputable maternity hospitals in the USA.